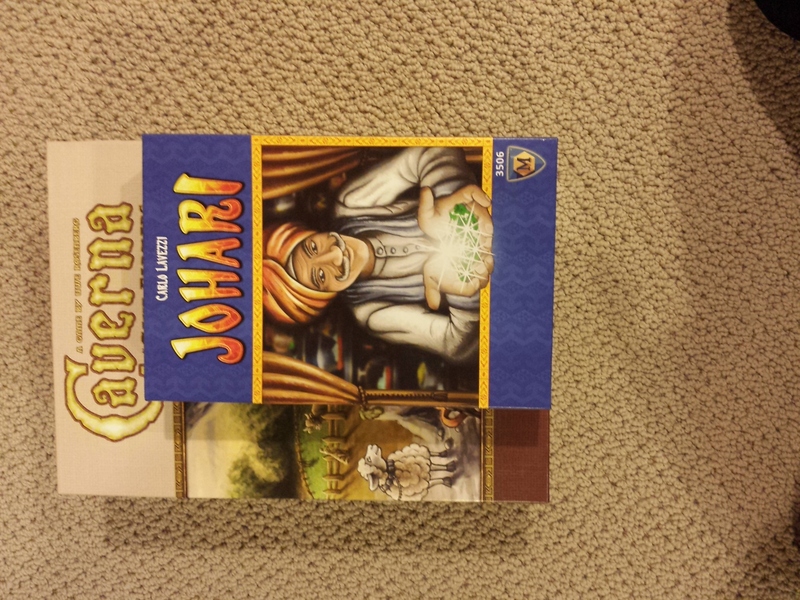 Johari is one of the first releases of the joint Lookout/Mayfair venture (if you recall, Mayfair purchased Lookout at Spiel ’13). According to the announcement, Lookout was to keep control of their game selection and development while taking advantage of the distribution network of the larger Mayfair. 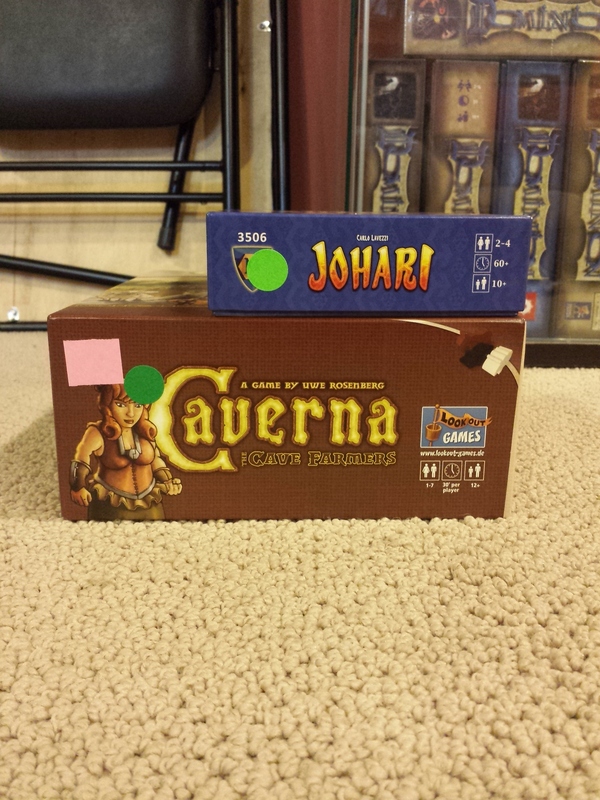 This newest release definitely feels like the Lookout games of old. 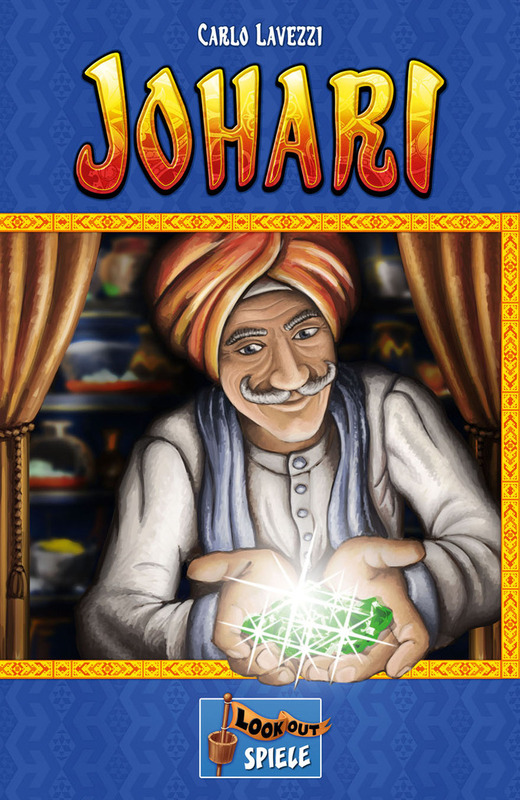 The players are merchants in the ancient city of Jaipur, and they try to collect jewels from the various stores and bazaar stalls in the city to sell to jewelers and collectors. 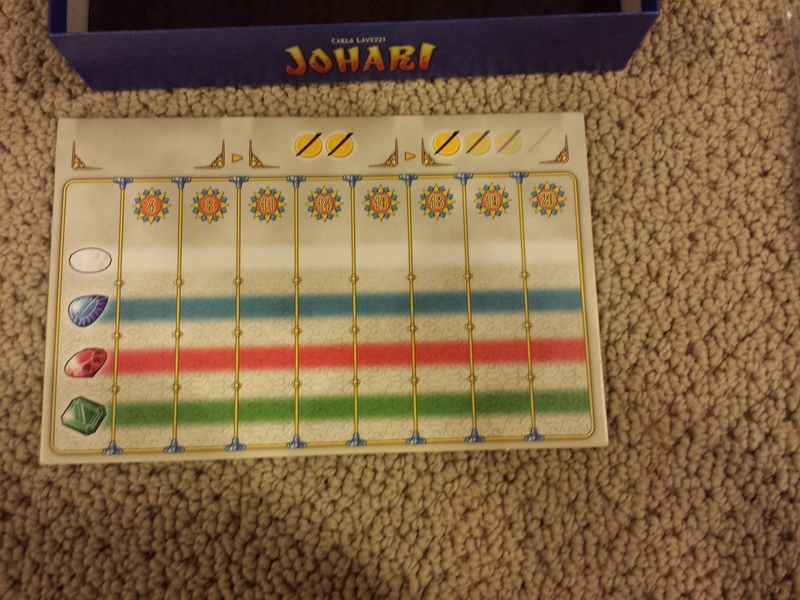 Each player has a player mat which shows how many jewels have been sold of each of the four types. The jewels are found on the gem cards, varying from one to three of a gem on a card. In addition, some of the gem cards may be “fakes” – they have a supervisor icon on them to denote this. The game is played over 10 rounds, each following the same pattern. The start of each round is resetting the board. A number of jewel cards equal to the number of players is drawn, and the cards are placed in the appropriate shops (each store only sells one kind of gem). Then, each bazaar stall is given a new card. If there are any gem cards left over from previous rounds, they simply stay there and that store/bazaar stall is just superstocked. Additionally, a new noble card is added to the road. The game starts with 2 nobles on the road, and ten more available, one for each round. Once the board is setup, then you move into the Action phase. There will be three actions each round, with player order for each action determined by the amount of money each player has (the player with the most money goes first). Each player has an identical deck of 7 Action cards which players choose from secretly and simultaneously. The Action cards have a cost at the bottom, from 0 to 4 gold. 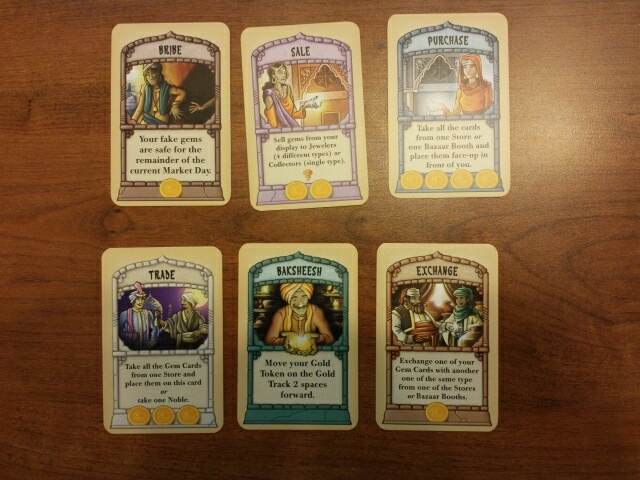 In the first of the three actions, players choose any card they want, and then in descending gold order, they pay for and take the actions. In the second round, players choose from the remaining actions in their hand, but everyone gets a 2 gold discount on the price of the action. In the third action, there is no cost for the action taken. Trade (3 cost) – EITHER reserve all the gems from one store (to be collected at the end of the round) OR influence a noble – pay a number of gems of one type equal to the road space that the noble is on. Each noble card gives you some VPs and most of them also give you some sort of enhancement to one of your actions. Purchase (4 cost) – you can buy all the gems in a single store OR bazaar stall. Unlike the Trade action, these gems go directly into your display and can be used now. Sell (2 cost) – EITHER sell gems to a jeweler or collector. 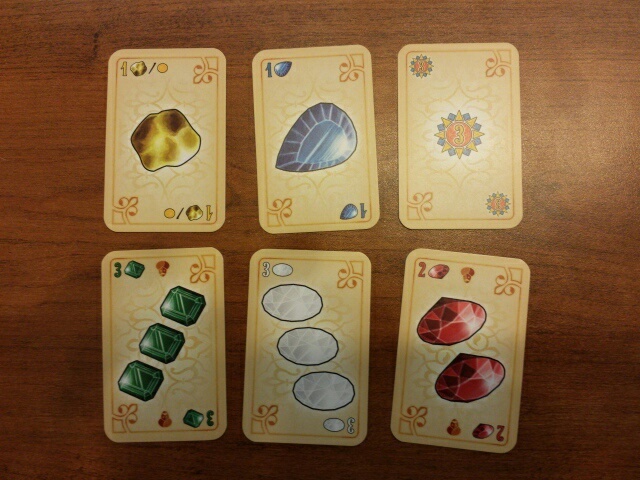 Jeweler: discard one gem card of each of the four types (can substitute a gold card for one type); then chose one of the gem cards sold and move your marker up in that particular type a number of spaces equal to the number of gems on that card. Collector: Sell all your gems of one type, but only if someone else has gems of that type AND you have the most gems of any player of that type. You discard all the gem cards and move your marker up on that type a number of spaces equal to the difference in number between your collection and the second place player. Furthermore, all other players have to discard one fake gem card. Bribe (1 cost) – this protects your fake gems for the rest of the round – i.e. you do n have to discard a fake gem card each time a player sells to a collector. Doppleganger (? Cost) – repeat the previously played Action card. The cost is the same as the original card MINUS the discount on the player mat. The game ends at the end of the 10th round. Victory points are added up. There are a few gem cards which simply give VPs, and each of the noble cards comes with a VP amount on them. The majority of the points though come from the four rows of gems on the player board. I really like the discounted action mechanic makes the game shine. Paying the full cost for an action (usually the Sale or Trade action) can be painful to the pocketbook – but taking those actions in the first action slot usually guarantees you a better choice from the shops/stalls. The other thing that you have to keep track of is your relative standing in gold – because the player with the most gold reserves is first in player order – and this also gives you a better action choice. The subtle changes to the actions from the Nobles cards also add a lot of strategic depth to the game. You can parlay an early expenditure of gem cards into an advantage that you can then use for the rest of the game. The Nobles that show up early in the game all have the enhanced actions on them while the ones near the end of the game simply provide victory points. They also give players a way to still try to score points in the final rounds of the game when it is unlikely that they can come up with regular sets to score. There are only 10 rounds in the game, and your 30 actions go by quickly. You really need to make sure that you maximize what you can get out of each action as a result. Though I’m admittedly a Lookout fan, this one definitely hits my sweet spot – lots of decisions to be made in a short time frame, and in a small box to boot! I totally agree – lots going on in a little parcel!